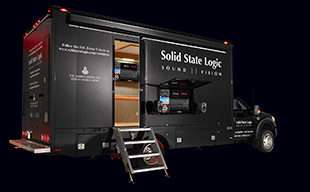 SSL BroadcastSuperior technology for live-to-air audio production. Smart software options to optimise and automate your workflow. 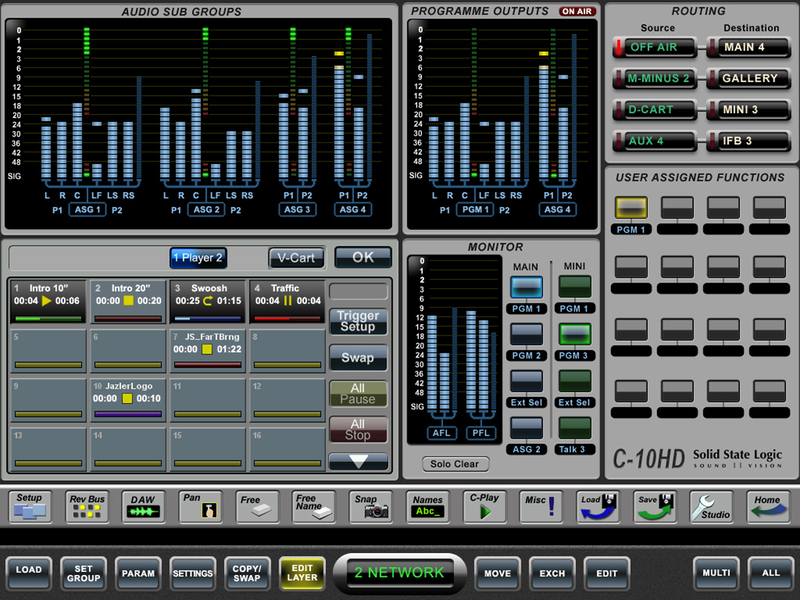 A range of unique software systems designed to streamline production workflow are a standard feature of C100 HD PLUS and C10 HD PLUS consoles. 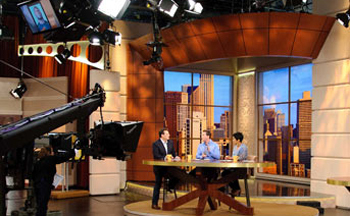 Each offers an innovative solution to a specific modern broadcast production challenge. They are all integrated into the console surface, placing hands on control at the heart of your workflow. Most automate key production tasks leaving experienced engineers free to concentrate on other aspects of the production or enable non specialist operators achieve professional results. Integrated spot and music Playout system. The C-Play system embeds a fully functional spot and music Playout system into the C100 HD PLUS and C10 HD PLUS broadcast consoles. Audio file Playout systems for spots and music are an essential part of everyday broadcast operations. Until now, broadcasters have been faced with sourcing dedicated Playout systems and preparing console Project and Playout systems individually. C-Play offers the broadcaster sophisticated fully featured Playout functionality with the significant ergonomic and workflow advantages of an embedded system, with console hardware control and where all Playout settings are recalled as part of a console Project. C-Play is a dual player system with one 5.1 player and one stereo player which can be independently assigned to any console channel. Once assigned the Channel Info screens show currently selected Cut, duration and playback status, including time remaining and end warning flash. Audio files are stored in a shared network location with bulk import capability streamlining import from a craft editor or library. A comprehensive Cut Creation interface facilitates non destructive editing where a single source file can be used to create multiple Cuts with trimming of Start/End points, Fade In/Out and a sophisticated Loop Play system. A dedicated Playlist creation interface streamlines the assembly of cuts into Playlists. Playlists have comprehensive one shot, sequential or automated playback and advanced playback controls including crossfades and playlist looping. Each Player has three different playback control options; ‘C-Play’ mode provides a list view enabling fast intuitive location and start/stop/retrigger of individual Cuts via a combination of touchscreen and hardware encoder, ‘FreePlay’ mode provides a 16 button touchscreen interface where multiple Cuts can be triggered simultaneously (the 16 touch triggers can be assigned to a single player or split in to two sets of 8 buttons), ‘PlayList’ mode uses the list view interface for location, selection and start/stop/retrigger of Playlists. In addition to the touchscreen control, playback can be controlled using Fader Start for hands on operator control or assigned to GPI control for triggering via a wide range of external devices or Automation systems. All Cut, Playlist and Assignment options are project based so when your console Project is recalled your entire Playout system is also recalled, dramatically streamlining turnaround between shows. One of the most physically challenging tasks facing a broadcast engineer is riding the faders to maintain a smooth, balanced mix in the fast paced environment of a multi microphone talk show. 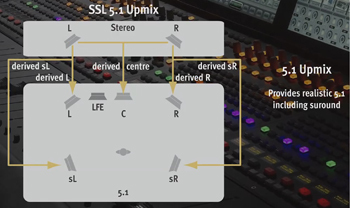 SSL’s unique Dialogue Automix is a standard feature of C100 HD PLUS and C10 HD PLUS consoles which provides software driven automation of this process. The Dialogue Automix system assists skilled and unskilled audio mixers in managing multiple live mics without having to continually ride their individual faders to eliminate spill and room colouration. Once a relative level has been set for each microphone, the system detects which mics are receiving an input and makes fast, transparent crossfades between them, freeing the mix engineer to focus on balance and sound quality rather than be chained to the faders. These voice-controlled crossfades closely track unpredictable dialogue, eliminating cue mistakes and late fade-ups, while avoiding the choppy and distracting effects common to noise gates. The overall gain of multiple active channels is automatically adjusted to keep the overall output equivalent to a single channel, thus eliminating obtrusive fluctuations in background noise when more that one channel is contributing to the mix. Dialogue Automix is freely assigned on a per channel basis up to a maximum of 16 channels. The system can be used with a mixture of local and remote sources, so not all the contributors have to be in the same location. The algorithm will work perfectly happily with someone on the end of a telephone line or at the end of a remote. The system provides a ‘Weight’ control on each channel which lets the operator establish relative ‘priority’ for individuals when multiple channels are open at once. The primary use of the weight control is to enable to host to ‘talk down’ other show participants. Lowering the weight control on a channel decreases the channel gain during ambience and lowers the relative gain if the channel is active with other channels. Raising the weight, increases the gain during ambience and increases the relative gain if that channel is active with other channels. It is also possible to globally adjust the automatic fade-in and fade-out times used by the Automix algorithm: The Attack time constant controls the fade-in rate and should normally be set at to a fast rate (around 1ms) to avoid an audible fade in on the start of a word. The Release time constant sets the rate of return to the ambient gain setting to avoid pumping effects between words. Automix activity is shown in the Channel displays with clear indication of which channels are assigned to Automix and level meter indication of individual channel gain reduction. Ensuring a smooth transition between 5.1 and stereo audio material is a common broadcast challenge. Our ‘5.1 Upmix’ option for C10 HD and C100 HDS consoles automatically creates a 5.1 surround mix from a stereo audio source and makes it available for manipulation. Upmixed 5.1 can easily be downmixed back to stereo or mono without any artefacts such as phase cancellation or comb filtering being generated in the downmixed audio. 5.1 Upmix can be applied to any stereo console channel. The system extracts spatial data from the components of the stereo signal to create a convincing 5.1 version of the signal. While a 'Centre' signal provides a soundfield anchor, the spatial elements can be positioned around the Centre to mould a convincing 5.1 effect for the stereo signal. Centre signal level trim (C-DB) affects the stereo width of the front image. Nominally set to 0dB, increasing the level will narrow the image and decreasing the level will widen the image. Centre divergence (C-DV) controls the spread of the front image. Normally set to 50%, a setting of 100% removes all signal from the Centre Channel giving a 4.1 Upmix often required when up mixing stereo ambience with dialogue in the centre channel. Bias (BIAS) alters the front/rear perspective. Increasing the bias towards the rear gives the perception of signals emanating from behind the listening position and is useful for increasing the effect of surround channels in ambience processing. LFE gain (LFDB) affects the Low Frequency Effect level._ Turn the Lower Quik-Knob to adjust the L-R pan. Recognizing that live Production Automation is a growing part of broadcast production,C100 and C10 consoles can be integrated with Grass Valley Ignite Ross Overdrive, Sony ELC and Mosart Medialab systems. 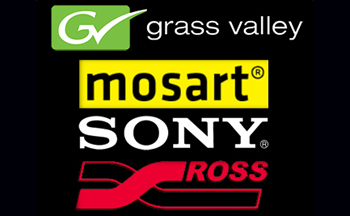 Fundamentally the SSL Broadcast Automation interface provides the Ross, Sony or Mosart Medialab automation system with a remote controlled mixer. This mixer follows commands issued from the Automation System (or the vision mixer/switcher) and thus controls the audio mix of the production. The Automation System works in parallel with the console’s physical controls, so if the audio operator adjusts the level of a channel under automation control, the audio will change level. The fact that the level has changed will also be flagged to the automation system. The limited abilities of the Automation System (fader level, on/off etc.) mean that the console is likely to be pre-configured for a specific show, to set mic gains, EQ’s, master bus settings etc. This can all be simplified by the creation of projects to work with specific automated productions. Automation can be applied to anything from a single channel to all channels of the console but typically a small number of channels are controlled. Using custom layers, the Channel faders under control can be hidden from the operator’s view of the surface, so that the console can be used simultaneously by an operator and the automation system without distraction. Automation can globally be switched on/off from a single console surface switch. 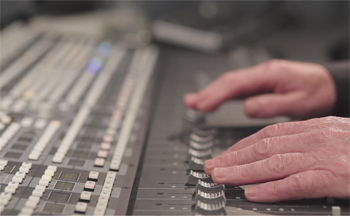 The C100 and C10 consoles can provide an ergonomic control surface for a wide range of popular DAW packages, allowing broadcast post-production to be carried out in existing audio control suites whenever they are not being used on-air. The ability to control the transport, dynamic automation and audio parameters within the DAW permits complex mixes to be created, and these projects can be moved from one room to another without having to separate audio and automation data, simplifying workflow. When the console is assigned to DAW control, it acts a control surface for the 'virtual' console inside the DAW. With the DAW tracks presented on the C100 control surface, the Fader Strip faders, pans, and ON/OFF functions control DAW channels, and additional channel strip keys provide automation status control and track record functions. Sends and I/O functions can also be modified. Cue and automation data is generated by the DAW, not the console. DAW transport controls can be assigned to console centre section buttons. The C100 and C10 use the HUI protocol providing a generic control interface with excellent real-time operation without the control latencies often experienced with other controllers. The console uses MIDI over Ethernet to connect with DAWs. Each virtual MIDI port supports eight fader channels, and the maximum number of ports a single DAW can use is four (32 channels) – DAW and console frame size permitting! 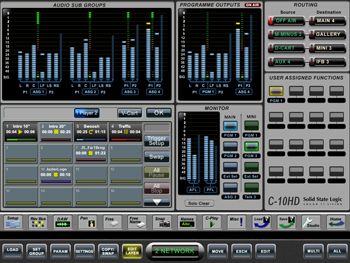 The console layout is fully customizable so that DAW control channels and the consoles internal audio channels can be placed alongside each other if required. 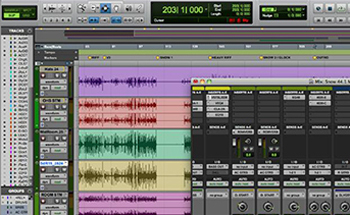 The consoles audio processing and monitoring capabilities can be used alondsige DAW control to provide a powerful and versatile production environment.